Rare books and manuscripts are a regular part of Mitchell Codding’s professional life, courtesy of his role as executive director of The Hispanic Society of America, located in New York City’s Upper Manhattan. “If you’re really interested in Hispanic literature, art, culture, that kind of thing, it’s like being a kid in a candy story. You get to deal physically with those objects, something most people don’t get to do,” Codding said enthusiastically of his role with the museum and library that compose the Society. Though he’s been in New York working for the Hispanic Society for more than 25 years—Codding became the Society’s assistant director in 1984 and has been executive director since 1995—he still remembers his time in Lexington and at UK fondly. 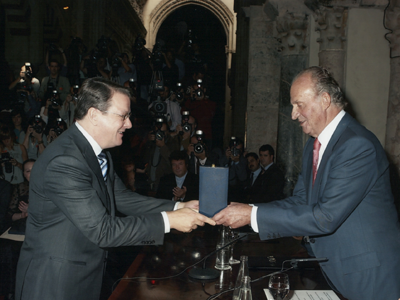 HM King Juan Carlos of Spain presenting the Gold Medal for Merit in Fine Arts, awarded by Spain's Ministry of Culture, to the Hispanic Society, represented by Mitchell Codding, at the Mezquita de Córdoba, Córdoba, Spain, 2006. When Codding completed his Ph.D. coursework at UK in 1983, the department operated as a Spanish department rather than under its current Hispanic Studies moniker. “Kentucky gave me an excellent preparation for the position I have,” he said. “That was enormously beneficial. Having a broad knowledge of Hispanic literature, culture, and art is essential.” Though Codding specialized in Latin American colonial literature during grad school, he was able to take a range of courses at UK that complemented this specialization, better preparing him for the breadth of materials he encounters at the Hispanic Society. Before coming to UK, Codding, an Oklahoma native, earned his bachelor’s degree in Spanish and completed coursework for a master’s degree at the University of Oklahoma. During his senior year, Mary Davis joined Oklahoma’s Spanish department. A UK alumna, she taught Latin American literature, which was Codding’s area of interest, and encouraged Codding to continue his studies at UK. Since UK had one of the top Hispanic Studies programs, he didn’t really look elsewhere. Codding’s dissertation advisor was Dan Reedy, who had also worked with Davis during her time at UK. While finishing his Ph.D., Codding participated in two research fellowships during the summer of 1982: at the John Carter Brown Library at Brown University and at the Hispanic Society. Upon completing his UK coursework, he served as a visiting assistant professor at the University of California Riverside for a year during which time the Hispanic Society contacted him about the new assistant director position they were looking to fill. The rest, as they say, is history, literally. The Hispanic Society was founded in 1904 by Archer Milton Huntington, the heir of railroad magnate Collis Huntington. Archer Huntington’s interest in Hispanic culture emerged early, and by the age of 16 or 17 he had decided he would eventually found an institution based on Hispanic culture, boasting a museum and extensive library collection. With over 300,000 modern books and 15,000 books printed before 1700, the Hispanic Society has the most extensive collection of Spanish books and manuscripts outside of Spain. Its holdings include Latin American books and manuscripts from the 16th through 20th centuries and Spanish books and manuscripts from the 11th through 20th centuries. Codding says the library is used extensively by graduate students and professors, including scholars who come from Spain for prolonged periods of time to sift through materials that aren’t available in Spain. Among the Society’s many rare holdings are: the only copy of the first edition of La Celestina, one of the most important late 15th century works in Spanish literature; the only surviving leaf of the late 15th century Valencian Bible, the rest of which was destroyed by the Inquisition; a manuscript of the earliest history of Guatemala; and many maps, including one of the most important early maps in existence, a map of the world by Juan Vespucci, nephew of Amerigo Vespucci. The Society’s collection also includes archaeological material dating from 3000 BC up to the 20th century and over 100 oil paintings by Valencian artist Joaquin Sorolla, some of which were commissioned by Archer Huntington. Because of the age of the Society’s buildings, Codding must navigate the challenges of an aging physical plant and very limited exhibition, storage and office space, though work is being done to renovate and modernize the facilities. He also noted the challenges of doing fundraising for an institution that hasn’t historically done much fundraising. Hence, the Society always operates on a very tight budget, though the library and museum offer free admittance to visitors. 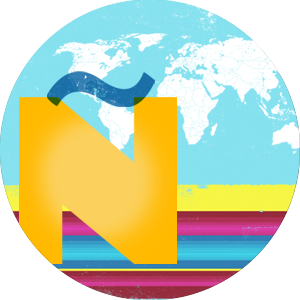 Codding notes that Hispanic Studies programs have necessarily shifted in order to thrive and survive, adapting to student interests. He points to the inclusion of film studies in many programs, which were previously limited to study of Spanish language and literature. Codding has appreciated the opportunities his work and studies have provided for traveling in Mexico and extensively in Spain, affording “first-hand knowledge of all these people and cultures.” One other gift of his studies at UK: Codding met his wife, who is Colombian, while they both studied at the university. Inauguration of the exhibition Joaquín Sorolla: Visión de España, Bancaja Cultural Center, Valencia, Spain, 2009. 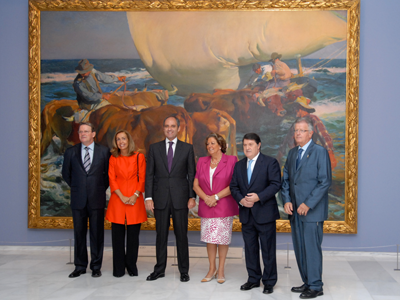 Left to right: Mitchell Codding; Blanca Pons Sorolla, great granddaughter of the artist; Francisco Camps, President of the Autonomous Community of Valencia; Rita Barberá, Mayor of Valencia; José Luis Olivas, President of Bancaja; Felipe Garín, curator of the exhibition. The painting in the background is Sorolla's Beaching the Boat (Valencia, 1903), from the collection of the Hispanic Society.